Located between Nicaragua and Panama, Costa Rica is a world renown destination for vacation. This often overshadows the fact that it is also one of the most productive countries in South America and has experienced an unprecedented economic burst in the last decade. This has made it a magnet for foreign businesses and professional individuals from all around the world including Canada. Whatever your purposes are in Costa Rica, you will need to provide documents such as manufacturer’s certificate, CPP, GMP, birth certificate, marriage certificate, and police check. Documents that are issued outside of Costa Rica will have to go through a process that makes them valid for use within Costa Rica. The same is true for documents issued in Costa Rica that need to be used in a different country. The most common process for this is the apostille process and dozens of countries use it. However, Canada is not one of those countries. Although you may have been told to get an apostille in Canada, this is not possible. Luckily, you have come to the experts. 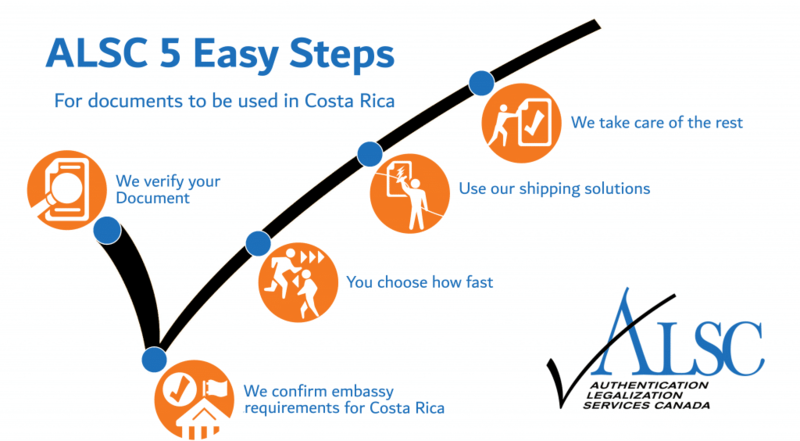 Since Canada has not signed the Hague apostille convention like Costa Rica, Canadian documents need to go through the original two step verification process in order to be accepted in Costa Rica. The two steps involved in this process are authentication and legalization. At first glance it seems like a straightforward process. In practice, this is seldom the case. Note that once authentication and legalization has been completed in Canada, your Canadian documents will require additional superlegalization at the Ministry of Foreign Affairs in San Jose. Authentication and legalization take place at two separate locations. The first step of authentication takes place at Global Affairs Canada here in Ottawa. The second step of legalization also takes place in Ottawa at the consular section of the Costa Rican embassy. Both steps have their own requirements and processing times which are subject to change. Global Affairs Canada can take over 20 business days to authenticate documents they receive, whereas the Costa Rican embassy has a processing time which ranges from a few days to weeks depending on various circumstances. As you might have guessed, the steps must be completed in order. Authentication is required first, and your Canadian documents must have a signature that is recognized by Global Affairs Canada in order for their agents to authenticate your documents. 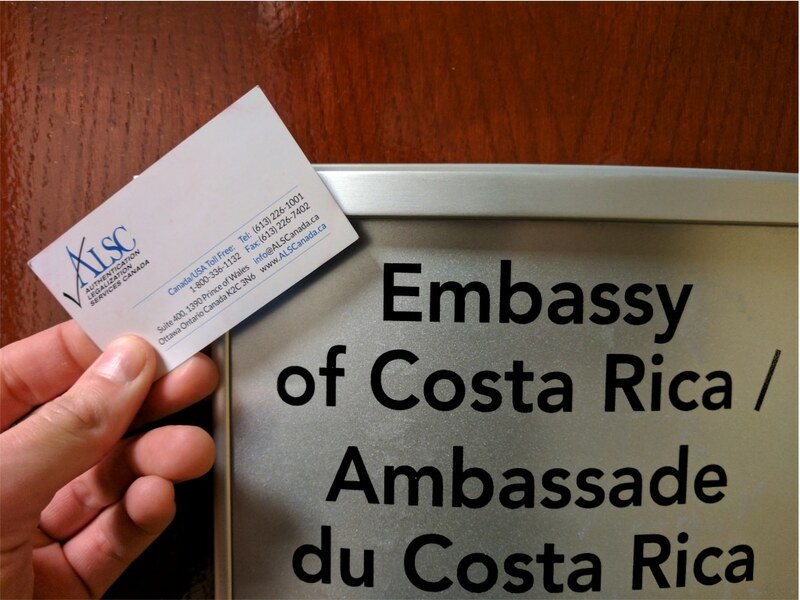 Once authentication has been completed, the consul at the Costa Rican embassy can legalize your documents upon verifying the stamp, seal, and signature from Global Affairs Canada and when all appropriate fees and requirements have been provided. In addition to shipping time and costs, it is clear to see that making your Canadian documents valid for use in Costa Rica can be a headache. Especially if you are doing so for business purposes in Costa Rica, long processing times and any unforeseen delays are not an option when there are deadlines to meet. This is not even including the superlegalization step that needs to take place in San Jose at the Costa Rican Ministry of Foreign Affairs. This is why thousands of Canadian businesses and professionals have chosen the easy and affordable alternative to going it alone: ALSC. 25 years ago we helped our first client process their Canadian documents for use abroad. Since then we have helped tens of thousands of Canadians process tens of thousands of documents for use in over 100 countries around the world. As such, we have become experts in all manner of Canadian documents including certificate of incorporation, corporate power of attorney, certificate of pharmaceutical product, good manufacturing practice certificate, police check, marriage certificate and birth certificate. Whether you are a Canadian business or professional individual, our experts are here to assist you with your Canadian document needs. We have built strong professional relationships with Global Affairs Canada, almost every embassy in Ottawa, and even dozens more across Canada. This allows us to be up to date on their changing policies, requirements, and fees long before most. This in turn prevents delays and allows us to provide our clients with a level of service that is unmatched in our industry. Our services expedite the authentication and legalization process, saving you up to 20 business days on our priority same business day authentication service. We also offer standard 3 business day and economy 10 business day services that marry affordability with speed. When you become our client, our agents assist you with preparing your documents and requirements for authentication and legalization of your Canadian documents for use in Costa Rica. Once the process has begun, you sit back and relax while we do the leg work, providing you with detailed updates at every step and being one phone call away if you have any questions or concerns. The same day your documents are completed at the embassy, they are ready to be shipped out to the destination of your choice via one of our many trusted shipping partners. We guarantee that your documents will be valid for use in Costa Rica. If you have any Canadian documents that need to be used in Costa Rica, give us a call or click for a free quote. We promise you one of the most professional services you will ever encounter. Feel free to continue reading for more information on various Canadian documents you may need to use in Costa Rica. Costa Rica has become a popular location for foreign businesses in the last few years. There is no exception when it comes to Canadian businesses. If you are a Canadian business looking to partner with Costa Rican businesses, expand or modify existing subsidiaries, or compete in Costa Rica’s marketplace, there are probably many documents that have been requested from you. These include certificate of pharmaceutical product, good manufacturing practice certificate, or manufacturer’s certificate. It is likely that you have many of these in an accessible location or at least familiar with how to get them. Many corporate documents are issued by federal bodies such as Industry Canada. Documents such as a corporate power of attorney can be drafted for you by a lawyer. Canadian corporate documents will need notarization by a lawyer or notary public before being accepted for authentication at Global Affairs Canada. If this has already been done, make sure to check that the stamp, seal, and signature all match and are legible. It is occasionally the case that it is difficult for agents at Global Affairs Canada to discern the name of the signatory which is grounds for rejecting your documents. There are some cases where processing your original corporate documents is not ideal. This can be because some corporate documents are difficult to have reissued or are simply too valuable to risk being damaged during processing. As such, it is common for our corporate clients to make notarized copies of their corporate documents for use in Costa Rica. We can even do this for you when you use our services. If you do not currently have documents such as articles of amendment or articles of amalgamation and need to get them, you can start by filling out the required forms by clicking here. If you have a Canadian commercial invoice or certificate of origin for use in Costa Rica, the Chamber of Commerce has a “TradeCert” Certification Made Simple service that can certify these documents. Furthermore, the signatures from the Canadian Chamber of Commerce are on file at Global Affairs Canada, which means any documents signed by them are valid for authentication. Since we are also members of the Canadian Chamber of Commerce, we can pick up your signed documents from their office here in Ottawa for processing. We can even begin processing your completed commercial invoice and certificate of origin if you send them to us via email. Please contact our head office if you are interested in either of these two options. Canadian vital statistics documents are arguably the most common documents processed for international use. These include birth certificates, marriage certificates, death certificates, and are frequently accompanied by documents such as divorce certificates, pension letters, and police checks which are discussed in further detail in the next section. If you are a Canadian looking to immigrate to Costa Rica, get married in Costa Rica, retire in Costa Rica, or resolve inheritance matters in Costa Rica, you will probably need one of these documents. Birth certificates, marriage certificates, and death certificates are very easy to have issued and to process for authentication and legalization. All you need to do is order them from the provincial vital statistics department of the province wherein the life event occurred. The signatures on all Canadian vital statistics documents are recognized by Global Affairs Canada which makes them valid for authentication, and personal documents usually have less requirements at various foreign embassies for legalization. Make sure you order the long form versions where applicable, particularly of the birth certificate since Global Affairs Canada cannot authenticate the short-form versions such as wallet sized birth certificates. The long form versions are also known as copy of an act of birth and registration of live birth depending on the issuing province. Divorce certificates are issued by the court which finalized the divorce. If you do not currently have your divorce certificate, you will have to contact the appropriate courthouse to issue a new one. If you do have it, make sure the stamp, seal, and signature of the court official all match and are legible for authentication at Global Affairs Canada. In the event they are not, contact your court. Pension letters from the Canada Pension Plan will require notarization by a Canadian lawyer or notary public to be viable for authentication at Global Affairs Canada and following legalization at the consulate of Costa Rica. If you do not currently have your Canadian pension plan letter, you can follow the steps listed here to get one. Use the links below to order your Canadian birth certificate, marriage certificate, or death certificate. You can have it sent to our office directly to save time! Canadian police checks are another document regularly requested for use in Costa Rica. This is usually for matters relating to employment or retirement. There are actually two kinds of police checks that you can get: locally issued police checks and RCMP police checks. The main benefit of a locally issued police check is that it is often quite easy to have issued from your local police station. Once this has been done, it will need to be notarized by a Canadian lawyer or notary public since Global Affairs Canada does not have the name of the authorities at every local police station in Canada and therefore cannot authenticate those original signatures. The primary drawback of a local police check is, along with the cost of notarization, that it is often based solely on name and date of birth which is sometimes not thorough enough of a criminal record check for authorities in foreign countries. In contrast, RCMP checks use both finger prints as well as name and date of birth. This provides a more complete picture of a person’s criminal history and is usually preferred by authorities abroad. The downside of the RCMP check is that it can be a bit more tedious to have issued since the process to do so is more extensive. However, since the RCMP headquarters is located here in Ottawa, if it is ordered from there to our office then it can save processing time especially if you are currently located overseas. In fact, many of our clients choose to do this. As such, be sure to check with your requesting party in Costa Rica as to which police check will suffice and think carefully about which police check you would like to process based on your circumstances. If you would like to get an RCMP police check, you can do so by following the steps listed here. Processing your Canadian documents for use in Costa Rica is very difficult to do alone. The authentication and legalization process is something unknown to the average Canadian until they are told it they need to have it done. Worse still, many legal advisors are also in the dark about the details of this process which adds to the confusion. Our experts are here to clarify, simplify, and execute the authentication and legalization process for you. Keeping you informed and stress free while we take care of the rest is our goal. Our A+ rating with the BBB, dozens of 5-star reviews on Facebook and Google, and our proud membership with the Canadian Chamber of Commerce are testimony to the fact that we do this quite well. We are always looking for ways to improve our services which is why we have worked hard in recent years to earn the title of the most accessible company in our industry. If you live in or near Victoria, Vancouver, Surrey, Calgary, Edmonton, Regina, Winnipeg, Toronto, North York, Mississauga, Halifax, or Montreal you are probably not very far from one of our service centers. These service centers not only save you a trip to the post office but allow you to ship your documents free of charge by FedEx to our head office in Ottawa for processing. Upon completion, you are given free shipping again to any one of our service centers for pick up or can have your completed documents shipped elsewhere at an additional cost. Make sure you contact our head office before using our service centers as we may not be able to process your documents otherwise. What are you waiting for? Save time and money in the long run and trust the experts at ALSC with your Canadian documents for use in Costa Rica!